PTM 1 & 2 Pallet Transfer Machines transfer stock directly from a hygienic pallet to a wooden pallet without tipping, rotating or reordering your stock. Our PTMs have typically seen use across the food and pharmaceutical industries but are adaptable to a number of industries. The Pallet Transfer Machine is fully automated and can be fully customised to meet your requirements including stainless steel construction. The pallet transfer system offers a wide range of benefits. Our PTMs are 1/3 the price of an pallet inverter without reordering stock, as well as eliminating manual handling saving time and energy and reducing risk of damage to stock. Our PTMs meet all health and safety requirements and have low noise pollution. 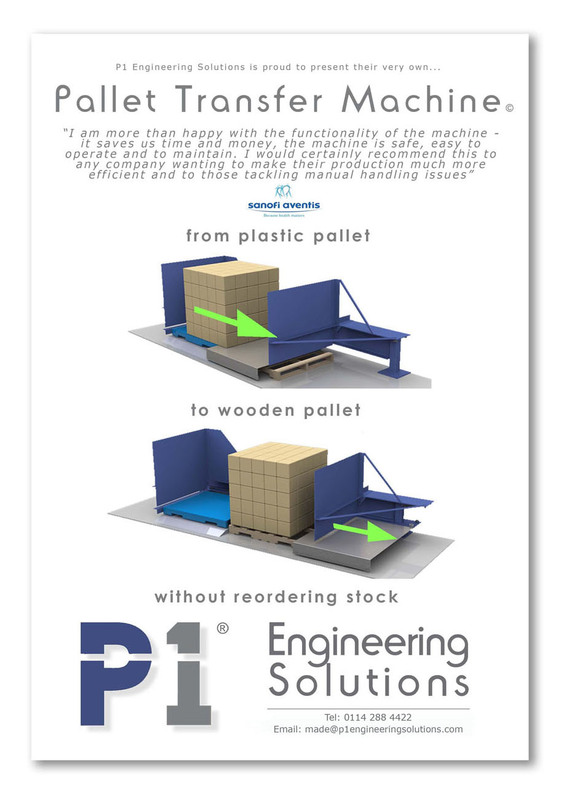 If you would like more information on the pallet transfer system including a viewing of a working model or would like an idea on cost, contact us on 0843 886 6468 or email made@p1engineeringsolutions.com.